The world’s most powerful particle collider has yet to turn up new physics [since Higgs] — now some physicists are turning to a different strategy. A once-controversial approach to particle physics has entered the mainstream at the Large Hadron Collider (LHC). The LHC’s major ATLAS experiment has officially thrown its weight behind the method — an alternative way to hunt through the reams of data created by the machine — as the collider’s best hope for detecting behaviour that goes beyond the standard model of particle physics. Conventional techniques have so far come up empty-handed. So far, almost all studies at the LHC — at CERN, Europe’s particle-physics laboratory near Geneva, Switzerland — have involved ‘targeted searches’ for signatures of favoured theories. The ATLAS collaboration now describes its first all-out ‘general’ search of the detector’s data, in a preprint posted on the arXiv server last month and submitted to European Physics Journal C. Another major LHC experiment, CMS, is working on a similar project. “My goal is to try to come up with a really new way to look for new physics” — one driven by the data rather than by theory, says Sascha Caron of Radboud University Nijmegen in the Netherlands, who has led the push for the approach at ATLAS. General searches are to the targeted ones what spell checking an entire text is to searching that text for a particular word. These broad searches could realize their full potential in the near future, when combined with increasingly sophisticated artificial-intelligence (AI) methods. The LHC smashes together millions of protons per second at colossal energies to produce a profusion of decay particles, which are recorded by detectors such as ATLAS and CMS. Many different types of particle interaction can produce the same debris. For example, the decay of a Higgs might produce a pair of photons, but so do other, more common, processes. So, to search for the Higgs, physicists first ran simulations to predict how many of those ‘impostor’ pairs to expect. They then counted all photon pairs recorded in the detector and compared them to their simulations. The difference — a slight excess of photon pairs within a narrow range of energies — was evidence that the Higgs existed. ATLAS and CMS have run hundreds more of these targeted searches to look for particles that do not appear in the standard model. Many searches have looked for various flavours of supersymmetry, a theorized extension of the model that includes hypothesized particles such as the neutralino, a candidate for dark matter. But these searches have come up empty so far. This leaves open the possibility that there are exotic particles that produce signatures no one has thought of — something that general searches have a better chance of finding. Physicists have yet to look, for example, events that produced three photons instead of two, Caron says. “We have hundreds of people looking at Higgs decay and supersymmetry, but maybe we are missing something nobody thought of,” says Arnd Meyer, a CMS member at Aachen University in Germany. Whereas targeted searches typically look at only a handful of the many types of decay product, the latest study looked at more than 700 types at once. 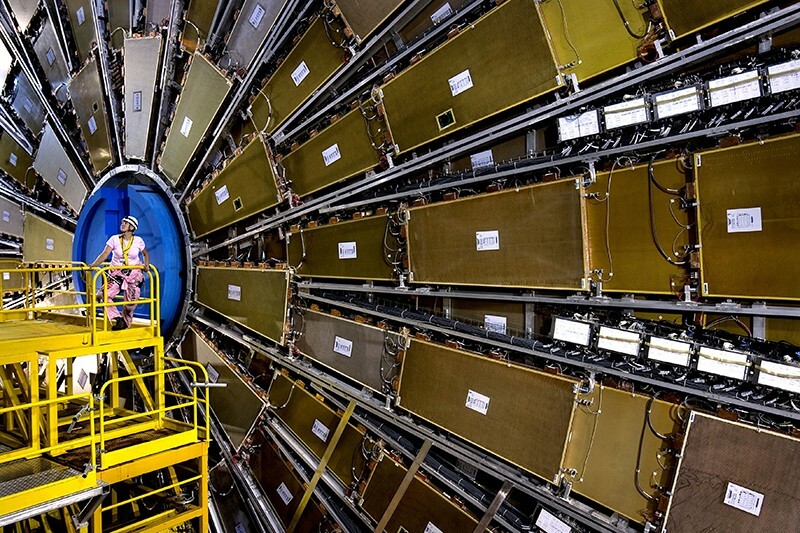 The study analysed data collected in 2015, the first year after an LHC upgrade raised the energy of proton collisions in the collider from 8 teraelectronvolts (TeV) to 13 TeV. At CMS, Meyer and a few collaborators have conducted a proof-of-principle study, which hasn’t been published, on a smaller set of data from the 8 TeV run. Neither experiment has found significant deviations so far. This was not surprising, the teams say, because the data sets were relatively small. Both ATLAS and CMS are now searching the data collected in 2016 and 2017, a trove tens of times larger. The approach “has clear advantages, but also clear shortcomings”, says Markus Klute, a physicist at the Massachusetts Institute of Technology in Cambridge. Klute is part of CMS and has worked on general searches in at previous experiments, but he was not directly involved in the more recent studies. One limitation is statistical power. If a targeted search finds a positive result, there are standard procedures for calculating its significance; when casting a wide net, however, some false positives are bound to arise. That was one reason that general searches had not been favoured in the past: many physicists feared that they could lead down too many blind alleys. But the teams say they have put a lot of work into making their methods more solid. “I am excited this came forward,” says Klute. Most of the people power and resources at the LHC experiments still go into targeted searches, and that might not change anytime soon. “Some people doubt the usefulness of such general searches, given that we have so many searches that exhaustively cover much of the parameter space,” says Tulika Bose of Boston University in Massachusetts, who helps to coordinate the research programme at CMS. Many researchers who work on general searches say that they eventually want to use AI to do away with standard-model simulations altogether. Proponents of this approach hope to use machine learning to find patterns in the data without any theoretical bias. “We want to reverse the strategy — let the data tell us where to look next,” Caron says. Computer scientists are also pushing towards this type of ‘unsupervised’ machine learning — compared with the supervised type, in which the machine ‘learns’ from going through data that have been tagged previously by humans. Nature is a weekly international journal publishing the finest peer-reviewed research in all fields of science and technology on the basis of its originality, importance, interdisciplinary interest, timeliness, accessibility, elegance and surprising conclusions. Nature also provides rapid, authoritative, insightful and arresting news and interpretation of topical and coming trends affecting science, scientists and the wider public.